Two images dominate popular conceptions of conflicts in early American history: Colonists battling Indians in defense of their lives and families, and patriot farmers battling red-coated soldiers in defense of liberty. At the Battle of Kingsbridge near White Plains, New York, in 1778, however occurred a desparate struggle of tomahawk against saber. But the battle confounded the ususal stereotypes of Indian-white conflict. The Indians were American patriots, fighting and dying in the cause of independence which they embraced as their own. Their adversaries were British loyalist soldiers. the Indians were from a mission town, Stockbridge, Massachusetts. The few who survived the War for Independence returned home to find that their lands and town offices had been taken over by non-Indian neighbors who stayed home during the fighting and benefited from the absence of the Stockbridge men. After the Revolution, Stockbridge Indians moved west, first to New York, and eventually to Wisconsin. 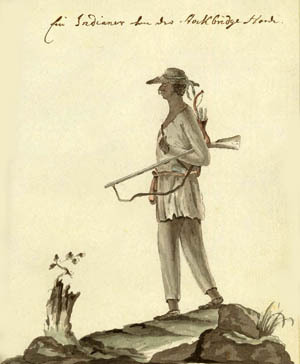 Richard Walling provides important information and source material about the Indians who fought and died in this battle. It was, relative to the tide-turning conflicts like Saratoga and Yorktown, a small affair and has generally been forgotten in the histories of the Revolution that became a national triumph. But it was a major catastrophe for the Stockbridge community whose men died there. The participation and sacrifices of these Indians in this war are a reminder of the complexities of the past. The subsequent experiences of these American patriots are crucial to understanding the place accorded to Indian people in the new nation they helped to establish with their blood.